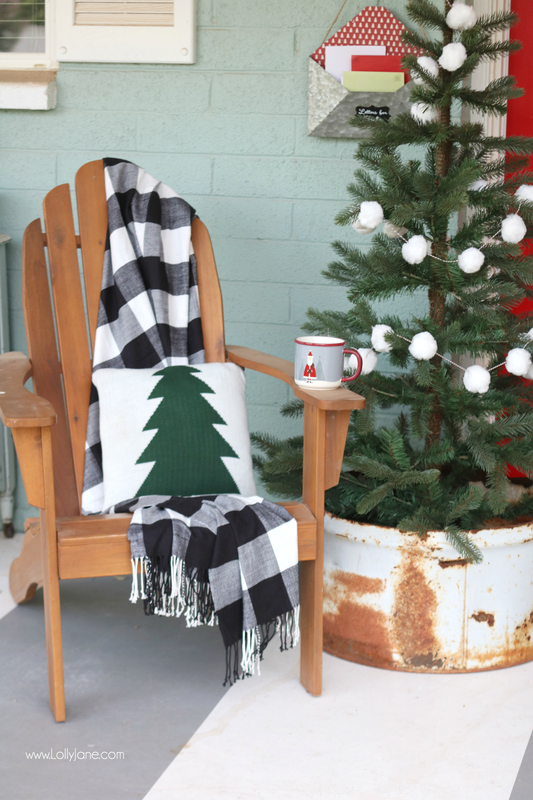 We LOVE shopping JOANN‘s for the latest in seasonal decor! We spotted these darling bottle brush trees on the end cap and nearly died of a decor heart attack! There were trees, all different sizes and colors along with spotted deer, houses and churches, trucks and cars, everything you need to create your own mini village! 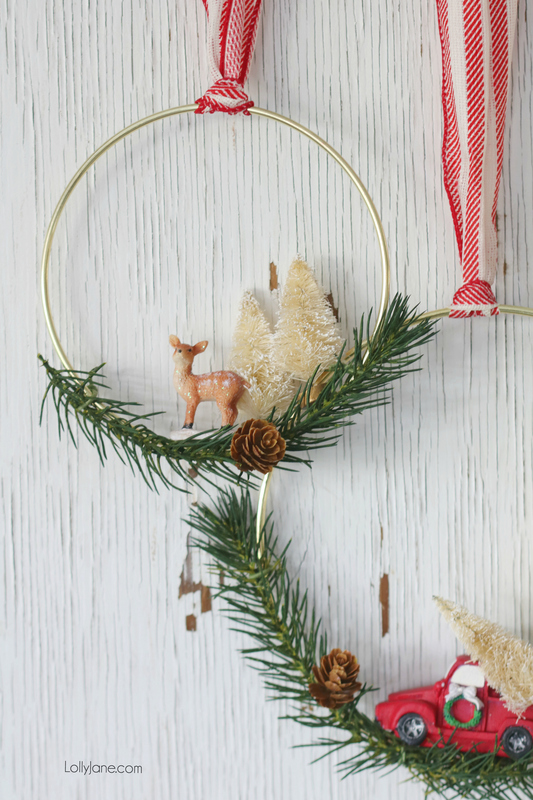 We have a thing with bottle brush trees and Christmas villages so adding them to a gold hoop to create a diy bottle brush Christmas tree was a natural branch on our bottle brush tree ideas. Get it, branch-tree? 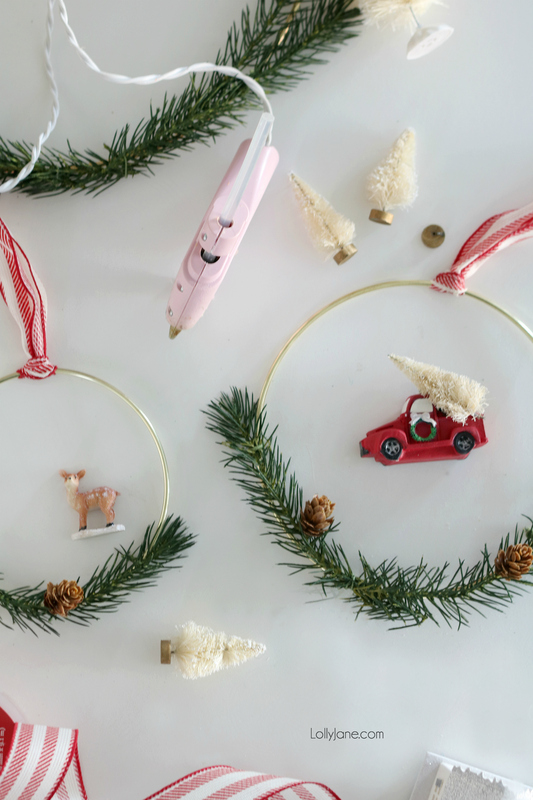 We’re so punny 😉 Read on for this EASY tutorial! 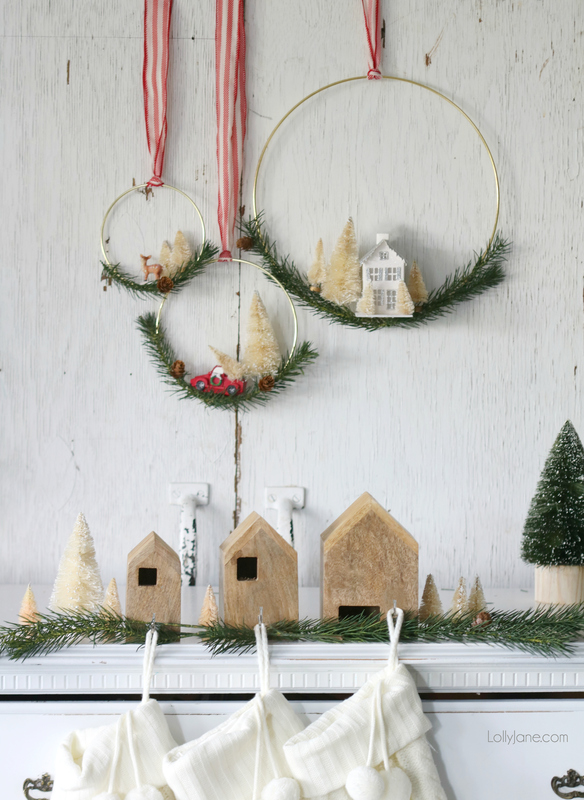 All you need is a basketful of pretties from JOANN‘s and about an hour of your time! 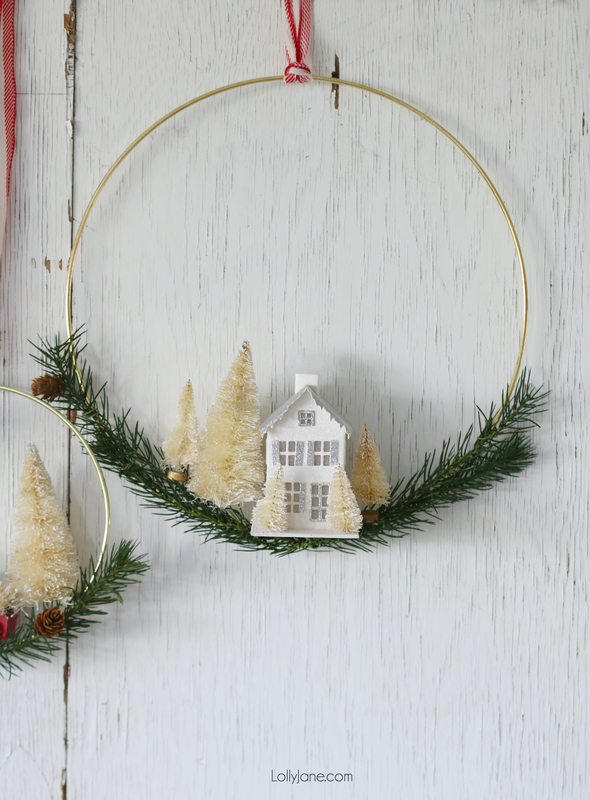 We used the wire cutters to cut our garland to length, covering the bottom half of the ring. We then wrapped the trees around the garland. Then we added different accessories to each ring until we liked what we ended with. Cut ribbon to length (about 18″ each). Fold ribbon in half to make a U shape. 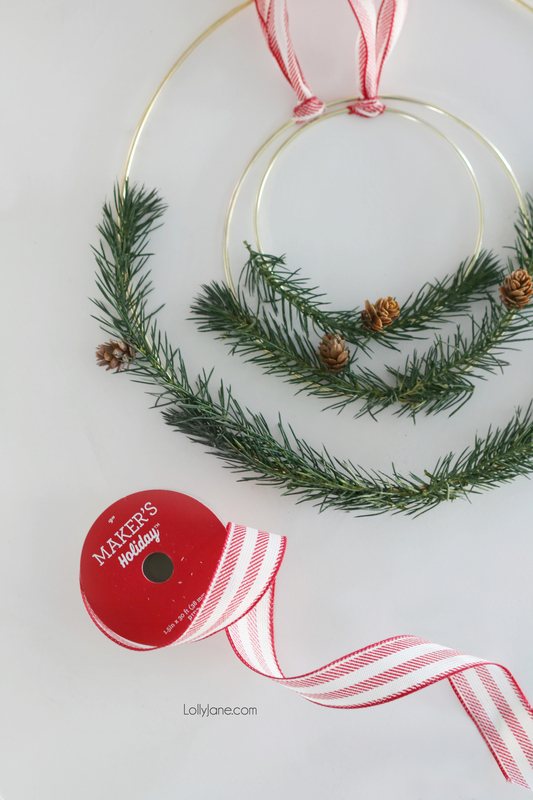 Lay it under the ring then pull the ribbon strings on top of the strings toward you to. 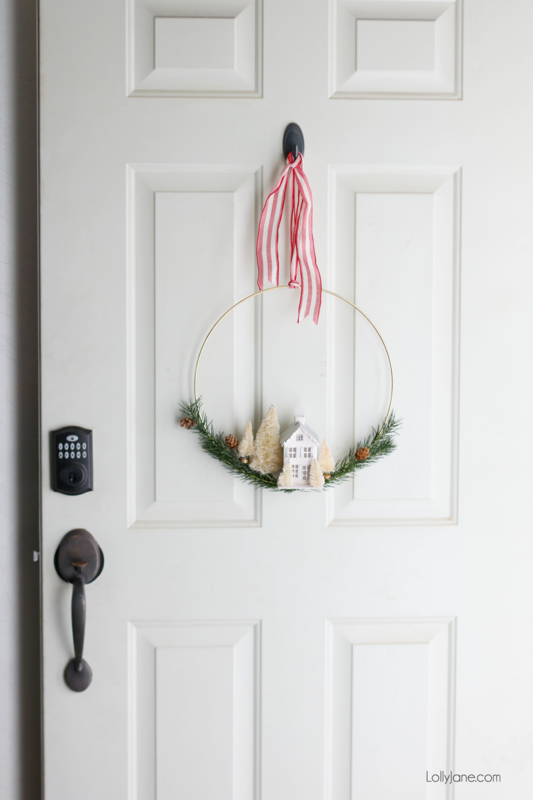 Display on your front door or around your home, wherever you need to add a little holiday cheer! We can’t get enough of these mini deer! They’re included in the doorbusters for Black Friday so be ready! That cute little truck came pink but we painted it red with DecoArt’s Cinnamon colored paint to have it match the ribbon. We hung a trio above Kristi’s dining room hutch to create a warm and cozy space for her family to enjoy. 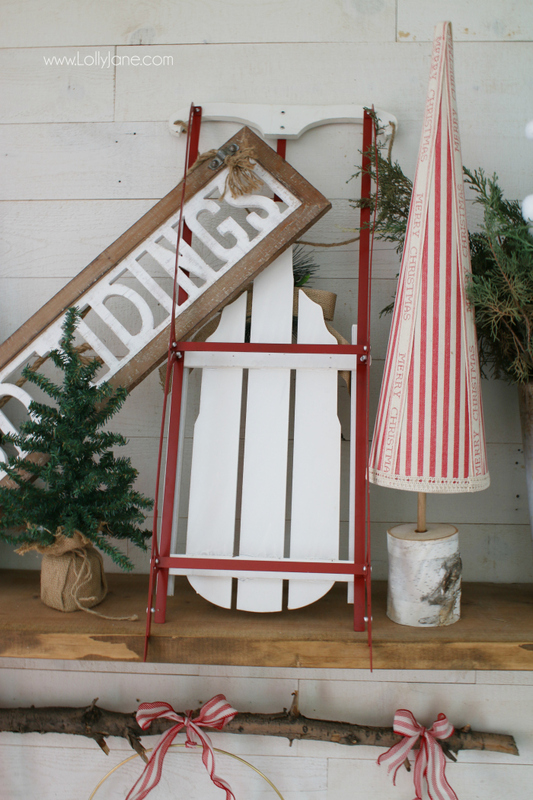 What a cute way to welcome guests this season! Happy crafting! 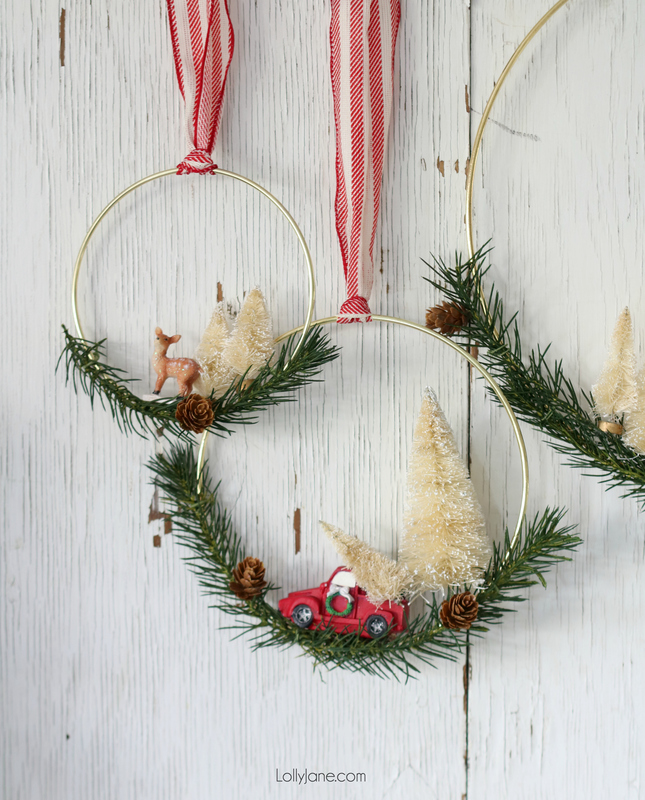 What kind of wreath do you like to display during the holidays? 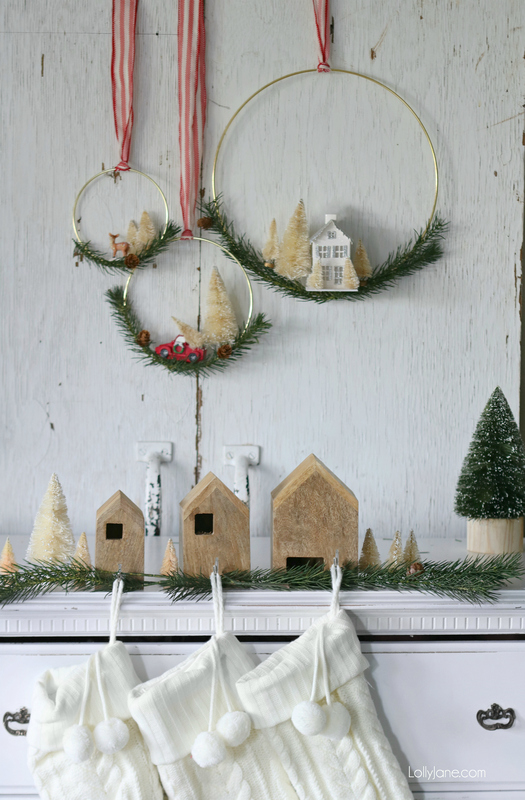 or our DIY Christmas Cones… love! So so cute!! 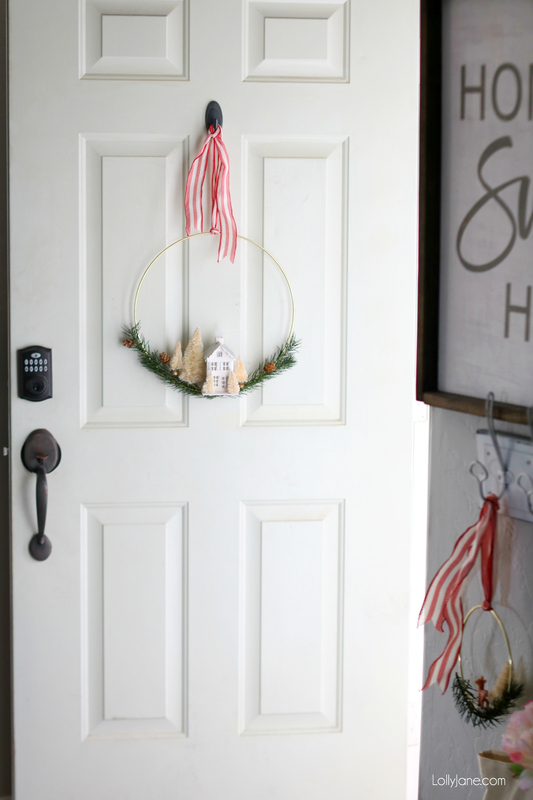 I would’ve never thought to make a wreath like this! I just made some floral hoop ones for my twins birthday party last week, but so clever to use something other than floral items. PS: We’re twins so of course we’re suckers for twins. Hope your twinners had a great bday!! So adorable… you guys are gold!? Well that is the sweetest comment ever!! Thanks Kelly! These are so adorable! Can’t wait to make them. 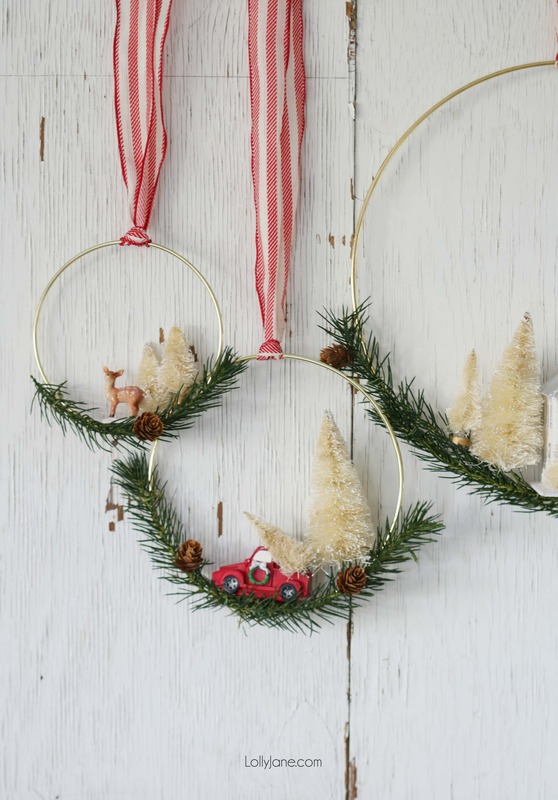 The wreaths are just adorable and so unique. Great job! 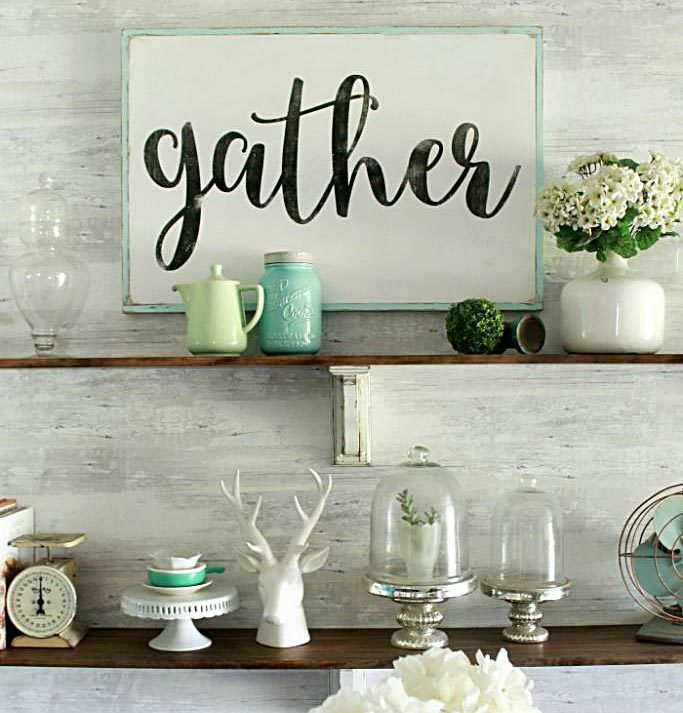 We hope you can find supplies to recreate this! Thanks for the lovely comment, Sue!